Wallabies captain James Horwill has rubbished criticism of the team's playing style by telling Inside Rugby that the sole ambition for his side should be winning Test matches. With the three-Test series against the British & Irish Lions starting in June, Horwill takes exception to any inference that the Wallabies are boring, adamant about the Australian sporting public being more concerned with the state of the scoreboard. "Mate, people want to win Test matches," he tells Inside Rugby. "You see someone run it from everywhere without playing smart, then losing that game . . . I don't think the public will be saying, 'Yeah, that's great'. As soon as the pressure picks up, all individuals understand what the go is." Exactly what is the go? "At a Wallaby level we've never gone out with the intention of playing a kicking game or anything like that. We've always had the philosophy to play. And play what's in front of us. We've always been about that. No-one sets out to play a dour brand. But sometimes games call for that. "In Test matches when the pressure's on and everyone's at the top level, it's harder to make sure you're always doing the right thing. Your mistakes are amplified - and punished - at Test level. Maybe you could get away with a few mistakes in Super Rugby, throw a bad pass or miss a tackle. But in a Test match, against really good sides, it's minimum three points. Probably seven." But if blokes have the freedom in Super Rugby to have a crack, and it so often comes off, couldn't that mindset be brought into the Test arena? Must we rein things in? "I don't know if we're reining things in," says Horwill. "We encourage guys to back themselves. If they see an opportunity, go for it, rather than go at it half-cocked so to speak. But, yeah, look . . . it's hard to tell you . . . but bottom line is we want to win as many Test matches as possible. And there are ways to go about it. We want to play smart rugby and the best rugby that suits the personnel that we've got. "We've got a group of guys who can attack. And we've got guys with a good kicking game. And I mean, kicking is one of those things that when done well is a great weapon. You can see the way certain teams do use attacking kicks to pressure the opposition." 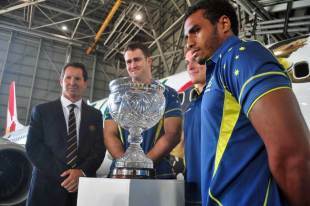 Horwill believes the Lions and Wallabies will be evenly matched for talent. And so the difference will be in attitude. "You've got to make sure everyone's on the same page and understands what they're doing," he says. "At Test level, across the top sides, the difference between ability is very small. In my mind, attitude is a massive one, being able to front up and start the game at your best. You also have to understand that mistakes can be costly. But you need to make sure everyone's on the same page and understanding where you're going. That's a huge one. It enables guys. Confidence is a really big thing. If you have confidence in yourself and your team-mates then no matter the situation you can pull through." Horwill's mantra against the Lions? No regrets. "There have been times we've played the All Blacks and been blown off the park; outplayed by guys who played better than we did, who applied themselves better to the job at hand. You can't go into these games with a sort of half-arsed attitude. You're either all-in or you're not. As soon as you're off by the slightest bit the big teams will hurt you. And that's the reality of Test match rugby and that's why it's so cut-throat." 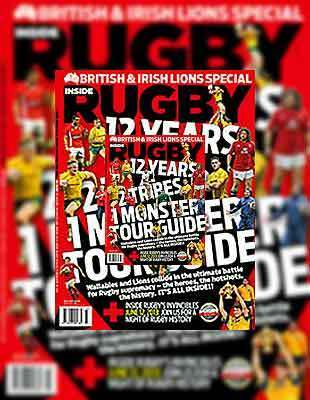 This is an edited extract from a feature interview published in the Inside Rugby British & Irish Lions Lions Tour Special, available now from usual outlets.